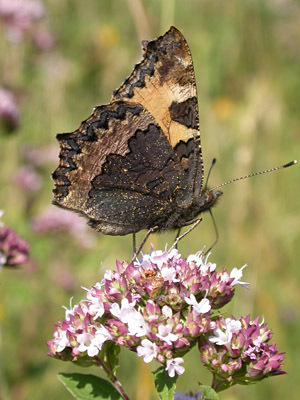 And right now we're at about the peak flowering season of one of my 'indispensibles' - Wild Marjoram. And the fact that you can cook with it too makes it the perfect all-rounder. When I say native, there are many plants that are called that which actually have a very restricted range in the UK, so are often not native to where you live. 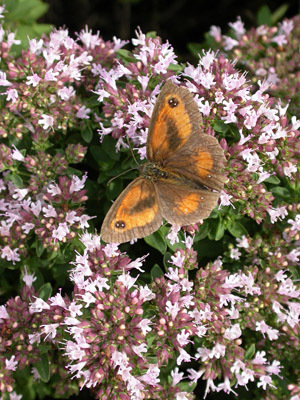 But Marjoram does well on that front too, because it is naturally found across much of England and Wales and right up into central Scotland. It grows to about 50cm tall, although it tends to be rather shorter on poor soils. I give it a Chelsea chop in May to keep it in check and stop it going too floppy. It has many small, simple leaves along its wiry stems, and right now each stem is topped with rounded heads of pink flowers that emerge from crimson buds. 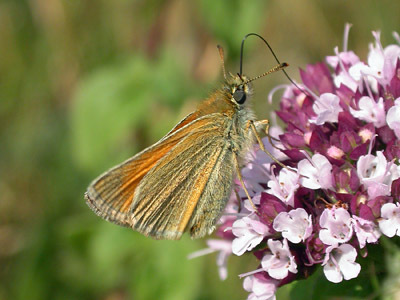 And what a nectar source it is, particularly for butterflies. All sorts of species will visit plants grown in sheltered sunny positions. Being a perennial, there's no mucking about with seed next year. It's just a case of cutting the old stems back to the base in late winter, and up it comes again. Want more plants? It's dead easy to take cuttings from; or you can layer it, poking some of the long stems into the soil to get them to root; or you can divide a plant by slicing it through with a spade. You can probably pick up a small young plant for three quid at a garden centre. And if you still need one final reason to grow it (surely not! ), then just call it by its other name, Oregano, and stick it on your pizzas. How can you resist?